We handle cases with drive and determination to obtain the best results possible for every client. When we go up against unfair insurance companies, they know our reputation for success and our relentless approach to getting just results. Our personal injury attorneys have more than 180 years of combined practice experience. An accident can have a lasting impact on you and your family for years to come. You need an attorney who takes the time to listen to you and understands your situation. You want an attorney who gets results and doesn’t back down from insurance companies or settle too quickly to move on to the next case. Our attorneys take the time to get to know you. As Managing Partner Steven Goff says, “I tell my clients from the onset that I will be personally available to answer their questions and to give them the attention their case deserves.” The people of Wisconsin need lawyers who truly value their interests. We don’t represent cases, we represent people. If you have been injured in an accident, we would like to set up a meeting to start getting to know you. We would like to hear you out and take the time to understand the unique details of your situation. This consultation is free of charge and allows you an opportunity to talk to someone who can make a difference. Bye, Goff & Rohde has been serving Wisconsin and Minnesota for over 40 years. We are committed to seeing that our neighbors are represented fairly in personal injury cases. For over 40 years Bye, Goff & Rohde has been getting results for those in Wisconsin who have been injured in an accident. Whether your case is big or small, we bring the same determination to see that you get the results you deserve. Because we bring a strong initial willingness to take your case to trial, we are consistently able to provide results. You won’t get lost in the shuffle with our firm, because we provide individualized attention to each case and each person. Corporate lawyers or insurance companies won’t push you around because we refuse to let them take advantage of you. You deserve a lawyer who is persistent and willing to go the extra mile to work toward a fair outcome on your behalf. Where other attorneys look to settle quickly and move on, Bye, Goff & Rohde has developed a reputation for being willing to go to trial if that’s what it takes to get you an equitable outcome. Insurance companies know this and fear it. We never forget that you have been injured. You aren’t just another case to us, you are a person who deserves the best representation. All partners at Bye, Goff & Rohde are Board Certified through The National Board of Trial Advocacy (NBTA). Only three percent of all lawyers are board certified. Martindale-Hubbell has recognized our commitment by ranking our firm AV Preeminent, an honor that is only awarded to 17 percent of lawyers nationwide. 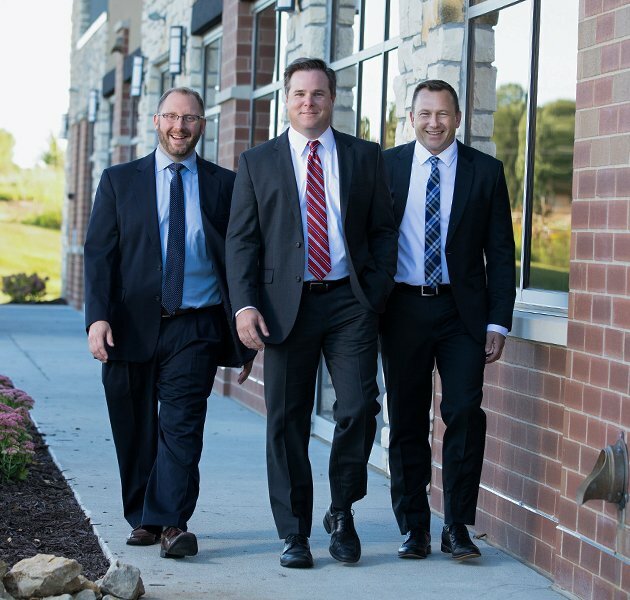 Our attorneys have a combined 180 years of experience, and you can rest assured that we are prepared and confident in our ability to try your case no matter how complex. Whatever the cause of your injury, you can depend on the attorneys of Bye, Goff & Rohde to have the expertise and experience you need. We always give clients our best whether the case has a million dollar value or a thousand dollar value. For over 40 years Bye, Goff & Rohde has been getting results for those in Wisconsin and Minnesota who have been injured in an accident. Whether your case is big or small, we bring the same determination to see that you get the results you deserve. Because we bring a strong initial willingness to take your case to trial, we are consistently able to provide results. You won’t get lost in the shuffle with our firm, because we provide individualized attention to each case, and each person. Corporate lawyers or insurance companies won’t push you around because we refuse to let them take advantage of you. Your case is about being treated with respect and getting justice for the harm that was done to you. Your case is about more than just money to you, and it’s about more than money to us as well. That is why when you visit us for the first time, your consultation is free. We’ll tell you the truth about your situation and whether you have a case or not. You pay no money to us up front. We believe that getting the justice you deserve shouldn’t add to the financial strain you are no doubt already under after your injury. You pay no fees unless we win or settle your case. Our attorneys go above and beyond to get you the results you deserve. That is why we prepare for trials, not settlements. It is why we’re committed to the excellence that being Board Certified requires. It is why we take the time to get to know you and hear you out. We will travel to your home to meet with you at no cost as well. You can be confident that every lawyer in our firm will work tirelessly to discover every possible source of compensation to which you may be entitled.